Black garlic, sold in specialist food stores, is garlic that has undergone fermentation. During the process, sugars and amino acids that are present in raw garlic produce a dark-coloured substance, responsible for its unique colour. Its flavour is sweet, subtle and complex. 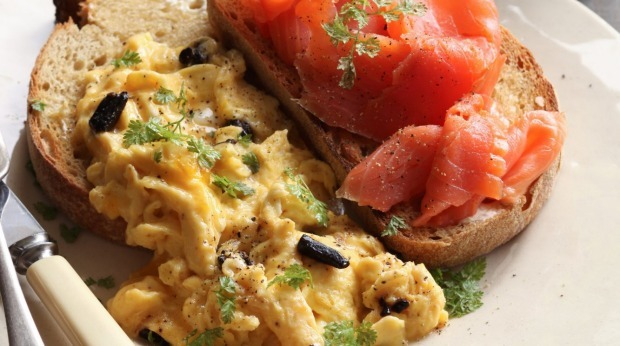 While it can be used instead of raw garlic in most recipes, a dish of scrambled eggs showcases its flavour, as a simple and elegant supper. Break eggs into a medium bowl and lightly whisk with milk or cream.Add black garlic and season with salt and pepper. Melt butter in a medium non-stick pan, add eggs and gently cook over low heat until soft curds start to form. Use a wooden spoon to stir the eggs to distribute and allow the remaining egg to cook. Remove from the heat when the curds have just formed and the mixture is still wet and glossy looking. Pile onto toast and serve with slices of ocean trout. Garnish with fresh chervil and extra salt and pepper.